Fall doesn’t start until September 22nd, thankyouverymuch. Summer for three more weeks! 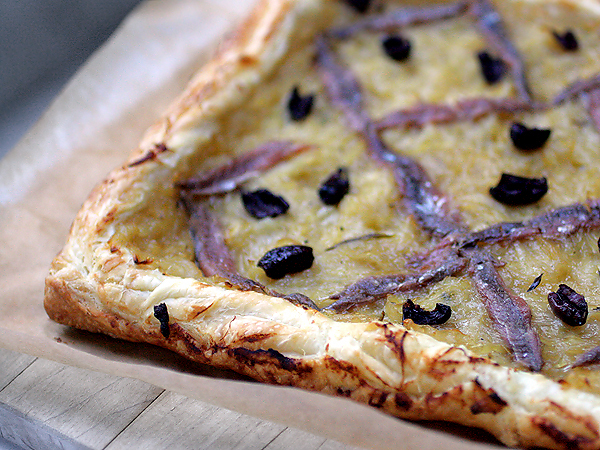 So Pissaladière, a Provençal caramelized onion, olive, and anchovy tart, the perfect kind of thing to have with a bottle of rosé chilled all the way down…to the south of France because, you know, it’s summer. For the topping, heat the olive oil in a very large saute pan and cook the onions, thyme, salt, pepper, and garlic over low heat for 45 minutes, until the onions are sweet and cooked but not browned. Toss the onions from time to time. Line a baking sheet with parchment paper and very lightly dust with flour. Unroll/Unfold the puff pastry dough onto the parchment paper on the baking sheet. Carefully fold about 1-inch of the dough over to create a raised “edge” on every side. Spread the onions evenly onto the puff pastry inside the raised edges. Arrange the anchovies and olives on top, brush the edge of the dough with olive oil, and bake for 20-25 minutes, or until the pastry is golden and crisp. Transfer the pissaladière to a large cutting board by picking up the parchment paper (you could probably just serve it right on the parchment paper). Cut with a very sharp knife and serve warm. 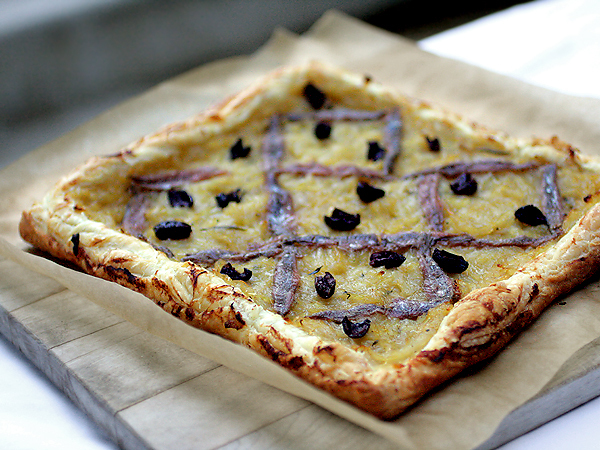 Like any pizza, cold pissaladière tastes pretty good straight out of the fridge the next morning, too (if you have any leftover, that is).